The first step is to be clear about what you're dealing with. Have your friend request a free copy of her credit report to confirm her current score. It might turn out that the situation is not as bad as the two of you are anticipating. If it is, you know where you stand and what needs to be addressed. As important as financial data is, credit information can sometimes be misreported. Check the credit report carefully and contact the reporting institution to clear up any mistakes or omissions. 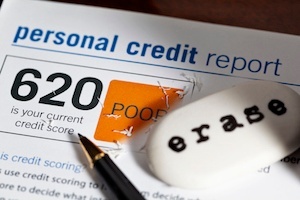 More than 25 percent of consumers have a credit score of 600 or less, which is the general standard of bad credit. Many people have been in your shoes, so don't be tempted to lie or misrepresent your situation. You may be surprised how willing landlords and management teams are to work with you. Is your friend's poor credit history due to problems with credit cards, but she's kept up her rent payments? Rental history is rarely included in credit reports, so it could be helpful to provide references indicating a good track record, showing that your friend makes rent a priority. If your friend hasn't already done so, she should stop incurring any further debt. Good credit scores involve more than just timely payments. A high debt-to-available-credit ratio is a sign of overextended finances, so it can negatively impact credit scores. Just about any financial transaction today can be processed electronically. Having the rent automatically deducted from your bank account demonstrates a commitment to ensuring that rent is paid promptly and in full. Our Springs luxury apartment communities offer online rent payment for your convenience. Our Springs on-site management teams have worked with everyone from college students leasing their first apartment to empty-nesters looking to downsize, and our residents include people from every stage of life. Stop by and learn more about the Springs difference!